Commonly used as a space to entertain guests or hold parties and events, decks are definitely a beautiful addition to your home. It is generally known that they come in various sizes and shapes. These days, it is fairly easy to custom-build a deck if you have an idea in mind and equipped with basic building skills. 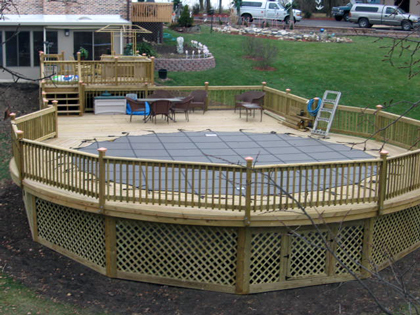 A circular deck in particular, enhances the overall look of your home and beautifies the area where it’s located. Compared to other designs, it is reckoned to be tougher to build. Nevertheless, with patience and good planning, nothing is impossible. Here are some general tips on how to build a circular deck. Firstly, you need to plan and prepare the site. Determine where you want your deck to be. Imagine and envision the outcome. It is always advisable to draw the plan to scale. Once you are certain, place some stakes around the perimeter. That way, you would go off-course in your building process. Next, lay the foundation by pouring cement. Getting this step correct is crucial because good foundation is the key to a lasting design. The general rule to remember is the larger the area, the more support beams you’ll need. Determine the center of the area. There should be a support for approximately every 1 foot. The following step is to dig a hole about 4 inches deep, pour concrete and add a rebar. 6 inches length should be sticking out so that you can create a support stub. Get some 4×4 wood and fasten it to the top of each outer beam to form the support frame. Flooring comes next. Choose solid deck flooring if possible. Use open flooring, leaving half inch gap between each board. Countersink screws to ensure stability. You will need indentions for railings, and it is always better to purchase pre-built rails and stairs. If you opt to build it from scratch, you will need extra supply of wood stock. Bear in mind to use 6 inch increment stairs so that children and the elderly can easily access the deck. Lastly, coat the area using a multi-purpose coat. This gives additional protection to the structure. To prevent slipperiness, you can also add sand when staining the area. These are ways on how to build a circular deck on your own. You can always get help from a friend or consult your local hardware store on the materials and equipments to purchase. Happy building!